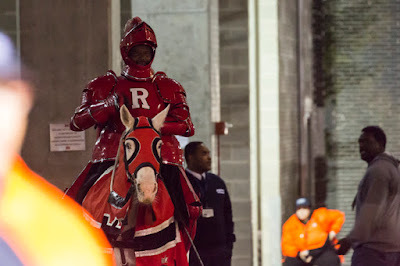 This IS a preview for Michigan at Rutgers 2018...I swear. Throughout history, the English and the French have gone to war about 23 times. For over six decades, these two historic programs did not care for each other one bit. And I mean, it's pretty fair to say that France invading English-controlled Normandy in 1204 and scattering little 'F' magnets around the courtyard of Château Gaillard could be seen as an act of war. I guess that's what happens when you have soldiers smack-talking each other on the way to the locker room after the Battle of Gisors 6 years prior. The bloodiest of all these conflicts was the Hundred Years' War which ranged from 1337 to 1453, a conflict that could warrant its own Game of Thrones series. The gist of it is the major English houses said "France belongs to us" but the French houses said "no, we're French, France belongs to us", and after some failed peace treaty talks, both sides decided to solve their problems with aggression. Oh, and plague. Some of the problems were solved with plague. In true Game of Thrones season 7 fashion, let's immediately fast forward about 78 years. The English army that had crossed the channel and made it to France was heading north to Calais, a prime recruiting area that would allow English soldiers that had committed to fight for King Henry V a shorter travel, making the war cheaper. But the French army had caught up to the massively outnumbered English army and was cutting off their passage. The exact strength of each nation is not 100%. But estimates suggest the French had about 2,400 cavalry knights, 7,600 infantry, 4,000 archers, and 1,500 crossbows - about 15,000-16,000 total. The English had about 1,000 infantry and 5,000 archers. The exact numbers are up to debate with historians, but the unit types involved are not. On paper, this is a battle that heavily favored the French and their S̶c̶a̶r̶l̶e̶t̶ knights. English longbowmen denoted with 'LB', soldiers denoted with 'S'. Cavalry denoted as 'C', crossbowmen as 'CB'. Black 'x's denote stakes to slow cavalry. The French strategy was to quintuple stack the A-gaps. French CBs made a business decision to flee. English LBs annihilated the French C all afternoon. In the days leading up to the battle, it rained. The fields were muddy. The French had set up a three-row line with cavalry up front, soldiers in the middle, and crossbowmen in the back. The English formed one large line of mostly longbowmen with infantry in the center. For a long time the two armies waited for one another to make a move. France had the advantage in resources, so England slowly began the advance fearing they would run out of food. They digged out their anti-cavalry stakes, and slowly moved forward. During this very obvious opportunity to make a counter-measure, France sat and waited for whatever reason, opting not to use any of their timeouts. It was at this point that the English longbowmen (LBs) began their assault. Their arrows started picking apart the French cavalry (C) and soldiers (S). The French cavalry began storming the field, but the mud slowed them down as they were picked apart by more arrows. The English had rebuilt their wooden stakes, which were a success, impaling many of the horses. The arrows continued to rain down and some of the horses began to panic and retreated back towards the French lines, damaging some of their own forces. The French decided to advance their infantry and run it up the middle. But the ground game was extremely hampered by the mud and the English air raid proved too much. The French simply did not have an answer to the English LBs. The English began taking prisoners and sent a scout out to the French crossbowmen saying "surrender or get annihilated." You can probably guess what the French response was. Despite outnumbering the English by 2x or 3x, the French were obliterated and embarrassed on their own turf. 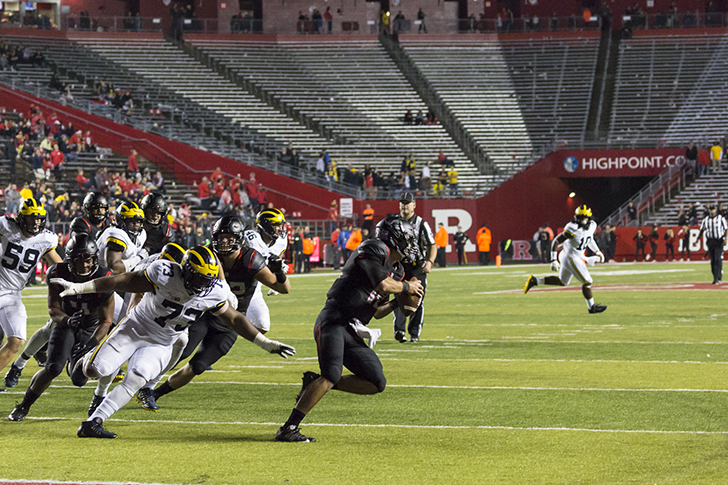 This marks the first known historic case of a rare 80x rutger. The tactical malpractice of the French armies got them destroyed and sent ripples for the remainder of the war and wars to come. 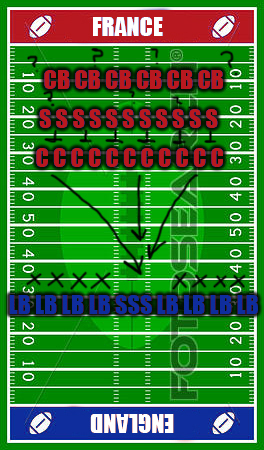 The introduction of the spread air raid offense also changed the scope of the way warball was played. This battle is a reminder that historic beat-downs can and will be remembered and discussed even 800 years after the dust has settled. 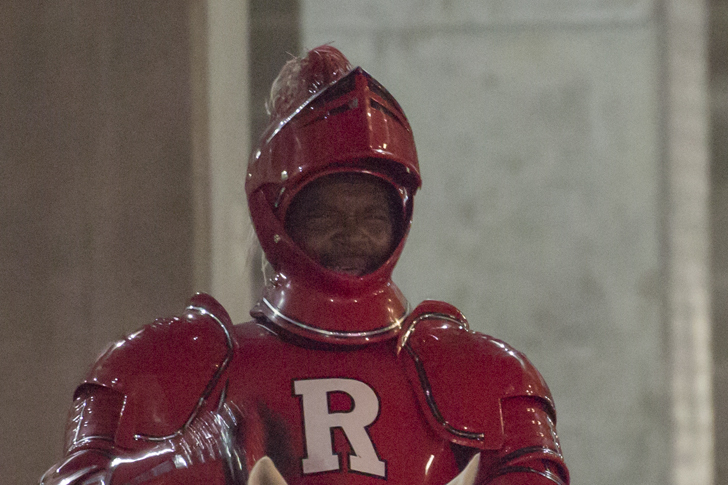 Anyways, Rutgers is the worst Power-5 team in D-I college football and Michigan's going to win by a lot.